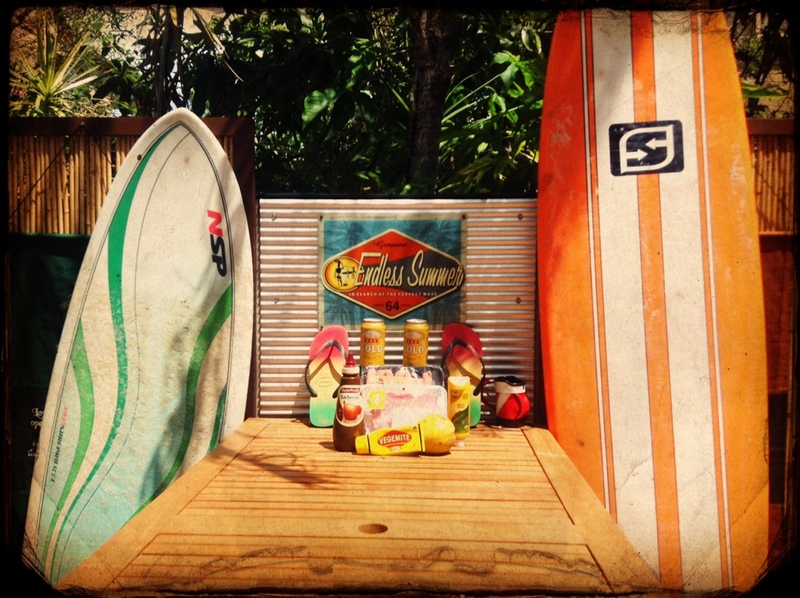 We flew back into Cairns on December 29th after our Christmas break to resume the great Aussie road trip. We only had carry on bags so we pushed our luck showing up at the Brisbane airport 10 minutes before boarding time. It’s a bad habit that I’m sure will one day backfire but until it does, it’s the best way to fly! You get escorted past the check in line ups, fast tracked through security and after a quick jog (free workout) to your gate you’re in the air! No siting around airport lounges senselessly spending money on overpriced food and drinks, or getting sucked into airport shopping. Again this is terrible travel advice but it’s been working for us! We had planned to go out for one more dive on the great berries reef but all the tour boats were booked until the 2nd of January and waiting in Cairns that long was unfortunately not going to work with our timeline. Instead we grabbed a hotel room at the Southside International for the night, once again after surfing Expedia For TD and booking.com to find a good rate. Travel Tip for Canadians reading this; if you have a TD Travel Rewards Visa you can find the same discounted rates booking through Expedia For TD and get double the points using your rewards card. We relaxed for most of hoe afternoon and got some much needed laundry done at the hotels in house laundry facilities. We have found a couple hotels that have coin operated laundry machines along the way which is great for road trippers and backpackers as you get a reprieve from the tent, which means A/C! The greatest single luxury in the heat of the Australian summer has got to be air conditioning, and you can do laundry without having to wait around a city laundry mat. We did dinner and a movie in downtown Cairns that evening, if you have dinner at La Porchetta a little Italian diner style restaurant you get movie passes for $12.00 with every meal purchased. A good deal as regular price tickets will run you anywhere from $17.50 to $20. La Porchetta is by no means fine dining but the food is good, portion sizes are big for the price and he service is quick and friendly. After dinner we caught the 8:30 showing of The Hobbit at an Event Cinema house, GREAT theatres! Large comfortable seats with arm rests that can be fully lifted, great for couples, or in our case great in an empty theatre for lifting 6 or 7 arm rest and creating a couch to lie on! It was like watching a movie at home…. With expensive popcorn. 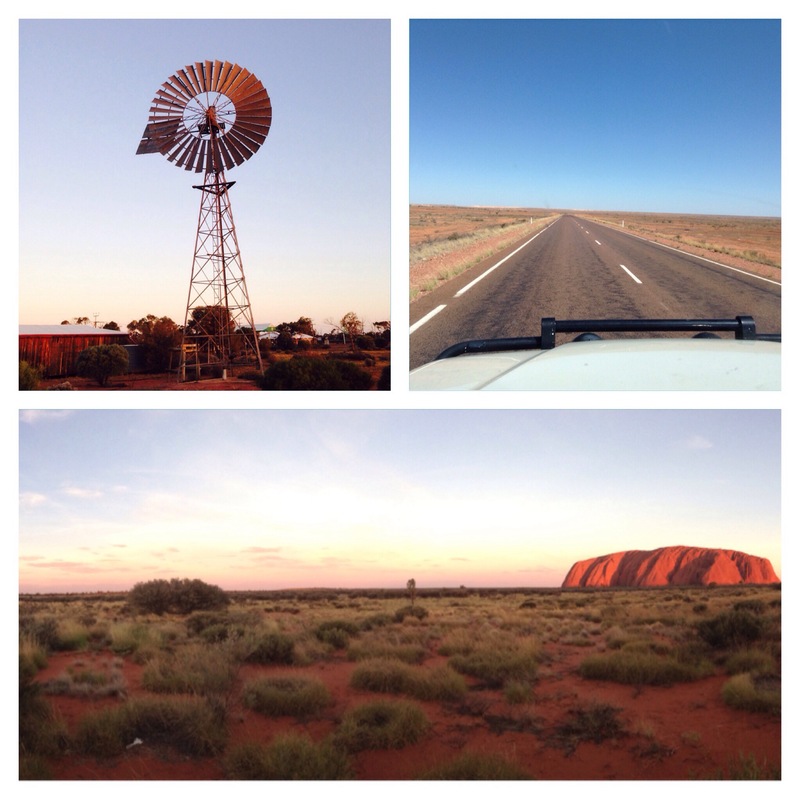 The next morning we set out for the Outback, we had 2,900 Km’s to cover to make Alice Springs and are real destination Uluru or Ayers Rock so I figured it was time to make some miles and settle in for one of our epic long haul drives. I figured we could run it straight through making only fuel and food stops and maybe one road side rest stop for a power nap. I hindsight this was a TERRIBLE idea. I have crossed Canada in straight shots more than once and in the dead of winter through snow storms and other insane road conditions but I underestimated the desert. There is nothing to acclimatize you to the punishing heat of Australia’s red centre in the heat if the summer. We had made great time south down the coast from Cairns to Townsville then headed eastbound on the Stuart Highway and into the outback. It’s amazing how quick both the landscape and the temperature changes. From the lush forests and cane fields of North Queensland to the arid scrub brush of central Queensland. The temperature seemed to climb with every kilometre, and we watched the land flatten out, the trees get smaller and the expanses grow to where the horizon line is barely visible. We made it to the very frontier looking town of Charter Towers late in the afternoon, beautiful old buildings fill the Main Street, like a lot of the far north if it wasn’t for new cars you would think nothing has changed here since the early nineteen hundreds. We stopped for a few groceries and more water and other drinks and continued on. We had decided to push on through the night figuring it would be a more comfortable drive out of the blazing heat if the day. Again we were wrong, for one the temperature only drops a few degrees and even at midnight it was still pushing 40 degrees! Without the air conditioning in the truck working we have been reliant what a trucker called running a 2×80 (2 open windows and 80 miles an hour). 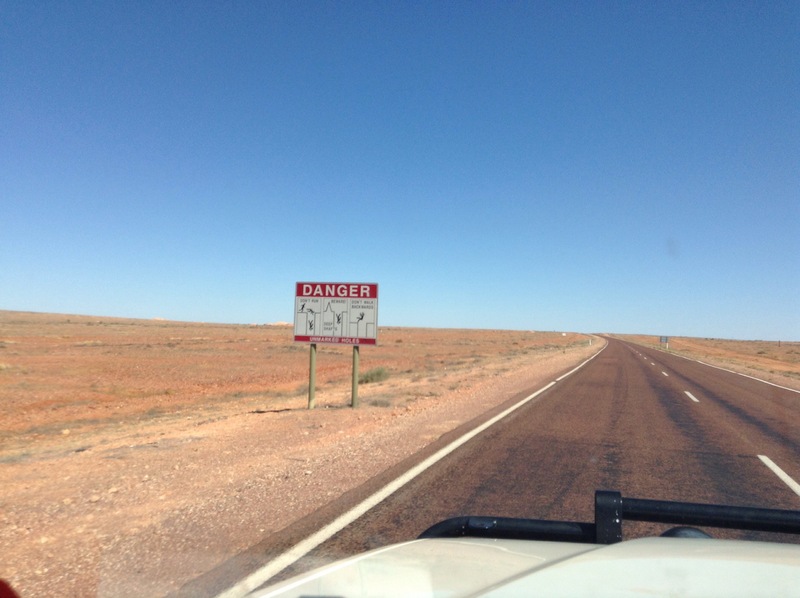 In the outback this doesn’t work, even when traveling at the posted 130 KMPH speed limit the wind is hot! This lasts into the night, the only reprieve is when you drop a little in elevation and you can enjoy a brief “cool” breeze. Most of the time it’s actually more comfortable to have the windows up to keep the hot air from blowing directly on you. Then there’s the Kangaroos, we had been told repeatedly that driving as many miles around Oz as we were it would be a miracle if we didn’t hit one, and up until tonight I thought everyone was exaggerating. As soon as the sun goes down and it becomes somewhat bearable to move, the desert that seems completely devoid of life save the roaming cattle and a couple million flies comes to life. Carly only recently got her full drivers licence so we were going over what to do if a Roo jumps out in front of the truck, the second we finished the conversation a huge big red kangaroo jumped out a few meters in front of us! Carly reacted perfectly! She didn’t swerve, slowed down as quickly as possible without jamming the brakes on and luckily for us and ol’ red there was no collision. began after running his ship into the reef off the coast. For us Barkly a Homestead was the beginning of our tribulations. We had made it about 15 minutes down the road when the cherry from my cigarette came off in wind and somehow managed to fly down the leg of my shorts! In this heat I was of course “going commando”, so now already boiling in he heat my bottom was literally burning!! With me screaming in pain Carly pulled over as fast as she could (between wiping her tears from the laughter) I’m fairly certain the truck was still moving as I jumped out and did he only thing that made sense at the time…. take my shorts off. Now I’m standing in the middle of the outback in the blazing heat completely naked with a burnt rear end, this is of course the time hat the only other vehicles we’ve seen all day drive past! Carly was now in absolute hysterics, she claims there were brief moments of sympathy but I’m not sure I believe her. We had left Cairns with big smiles and the hopes we would ring In the new year in Alice Springs, turns out the red centre had other plans. We made it to Tennant Creek finally and decided that we would spring for a hotel room. At this point I think we would have paid just about anything for air conditioning. It was after all New Year’s Eve and we needed a break. The young girl at the Bluewater Motel was extremely nice and offered us a discounted room and gave us a couple of cold drinks on the house. We had planned to camp but in all honesty we needed to be out of the heat. Tennant Creek is an odd little town but the hotel had a pool and it was close to the Devils Marbles which we planned to visit the next morning so this is where we would spend New Years Eve. By far the quietest New Years we’ve had in ages, after a long swim we relaxed in our room and watched the festivities live from Sydney Harbour. The next morning we continued south towards Alice Springs, our first planned stop was at the Devils Marbles conservation area, located 100 Km’s south of Tennant Creek and about 400 Km’s north of Alice Springs, The Devils Marbles are giant limestone boulders that appear like an oasis, it’s an incredible sight in the middle of the desert. Formed over millions of years through erosion, many of the boulders are precariously perched on one another and seem to defy gravity standing on up on end. There is a small camp ground and a few unofficial walks through the site, well worth a visit. Like other outback icon Uluru and Kata Juta the marbles are at their best at sunrise or sunset as the red rocks seem to glow. The traditional owners call the site “Karlu Karlu” which translates literally to round boulders. This is a sacred place for the aboriginal peoples of the Northern Territory, many creation legends exist but due to the sites significance most can’t be told to non Aboriginals. The site has been used for centuries as a place to gather, hunt and collect water. The Northern Territory has a unique beauty, the vast expanses of almost barren land posses a spirit. I had been told that the outback could be summed up in by a photo of windmill with nothing but wide open space around it, after our third day here I would disagree. Yes it is a barren landscape, but here is a rugged beauty that changes form as you move through different areas, and when you see places like the Devils Marbles you’re in awe of wonders of the red centre. We wanted to stay for a beer but unfortunately the pub had been broken into the night before and they were closed to do inventory of what was stolen. The culprits had already been arrested as they broke in, stole a bunch of liquor and beer then proceeded to sit across the road and drink it! By late afternoon we had made it to Alice Springs, the capital of the Northern Territory. From books and movies I have always wanted to visit Alice Springs and was very happy get the chance to visit. It was however January 1st so not most businesses were closed so we poked around town a little, had dinner and carried on towards Uluru. In hindsight I would have liked to stay in Alice longer but in all honesty it’s not what I had imagined. I found towns in the desert to be quite pretty, heritage buildings, with a frontier feel and plenty of interesting characters. In Alice we didn’t really find this, it’s a large town (for the outback) but it lacked something. Our next stop was at the Stuarts Well Roadhouse, if you’re looking for a bite to eat or a place to stay on the Stuart HWY this is your place! 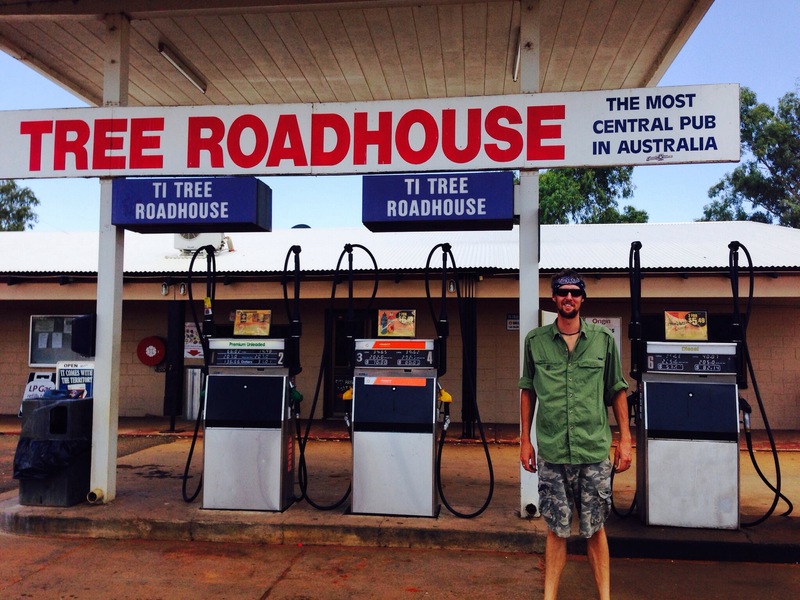 It’s been called “a roadhouse with a difference” and that’s the truth! The owners and staff are fantastic, we ended up hanging out here for a couple of hours chatting with the staff and a couple of truckers who make regular stops at the roadhouse. As we sat in the shade at 6:30 pm the thermometer read 47 degrees! You know it’s hot when Northern Territory locals are complaining! With well priced food and accommodation the Stuarts Well Roadhouse and caravan park as well as the neighbouring camel farm offer a great jumping off point to visit some of the Northern Territory’s most famous land marks. They have powered and unpowered camp sites, cabins, a pool and along with the restaurant sporting a pool table, musical instruments and a small gift shop. This really is a place to visit while in the area. After another nerve racking night drive we pulled into the Uluru Resort. We had been told that this is really the only place close to “the rock” you can camp, especially if you plan to make it to Uluru for sunrise. Being close to midnight we were exhausted, we found an empty site and quickly set up our beds in the back of the truck. In what seemed like only minutes we were up to sound of our alarms to make the short drive to Uluru before sunrise, only a few minutes down the road you get your first glimpse of Ayres rock in the shadowy light before sun up. 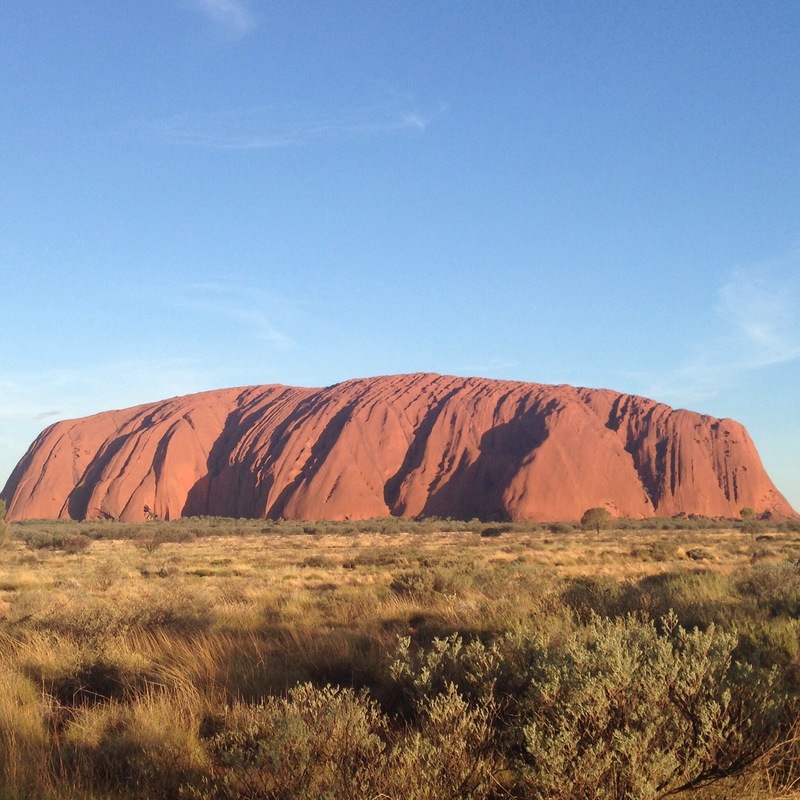 As soon as you see this incredible sandstone monolith you can feel its presence, and there’s no question as to why it has been a sacred place for the aboriginal people for thousands of years. Entrance to Uluru National Park is $25 per person, this gets you a three day pass to explore Uluru, Kata Juta and the surrounding area. There are a number of hikes in the park however due to extreme heat pretty much all the walks were closed the two days we spent in the park so we will have to go back again (in the winter ;). As the sun came up over Uluru you can’t help but get a little emotional, there is such a beauty and a spirit to this land and Uluru is more than just a rock. Shooting 348 metres out of the barren landscape that surrounds it and at almost 10 Km’s around the monolith is beyond impressive, the colours of the rock and the land change as the sun rises each moment seemingly more beautiful than the last. I have seen thousands of images of Uluru and read about it since I was a little boy so standing before it was definitely one of the highlights of my life and one of the most spiritual travel experiences I’ve ever had. Carly and I spend as much time as we can outdoors and share a passion for nature so to share this experience together as newlyweds was incredible. We were disappointed that we couldn’t do the base walk as there is 5000 year old rock art and both the sunrise and sunset viewing areas are still a distance from the rock itself. More upsetting however was seeing the one morning walk that was still open. They are still allowing people to climb Uluru which in our opinion is disrespectful to the traditional owners of the land as the Yankunytjatjara and Pitjantjatjara people view this as a sacred place that shouldn’t be climbed. Even as an avid rock climber I wouldn’t think of climbing the rock. 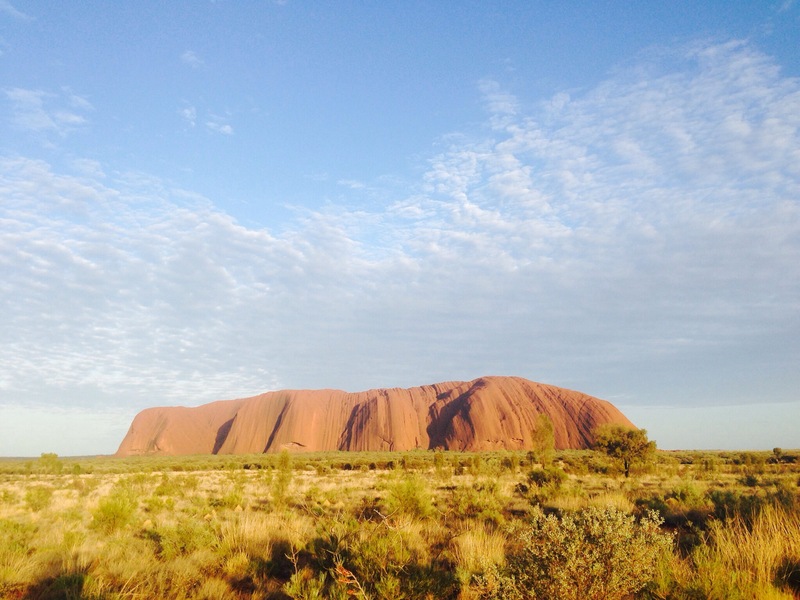 If you visit here we urge you to take the time to read about the history, and cultural of Uluru and the traditional owners of the land, there are many online resources like Parks Australia where you can learn a bit about the culture before your visit. During your stay the purpose built town of Yulara has a cultural centre where you can learn more about the local aboriginal peoples history. After a few hundred photos we returned to Yulara and the Ayres Rock Resort to properly check in to the camp ground and have some breakfast. The woman working the reception was great, offering lots of information on the area and even better as we had arrived so late she only charged us for one nights stay! Yulara and the Ayres Rock Resort offers a number of accommodation options from unpowered camp sites at $36/night to posh apartments hotels, spas and cabins that can run you up to $400 or $500 a night, so pick your poison, there really is something for everyone’s tastes and travel styles. For the self sufficient Yulara has a supermarket, post office as well as shops and cafés which are all reasonably priced so you don’t need to stock up before your arrival. Carly and I believe in shopping local and supporting local business both at home and while travelling so try our best to shop at our destinations. Even in the off season Uluru is a busy place so reservations are recommended year round and during the cooler months they would be essential as the park sees 250,000 visitors a year. We spent most of the day relaxing and really just trying to stay cool and hydrated, luckily Ayres Rock Resort has a pool! In fact your camping fees give you access to all the pools at the other resorts as well! The pool was on its own worth the $36 and we spent most of our day in the water or beside the pool in the shaded BBQ area. 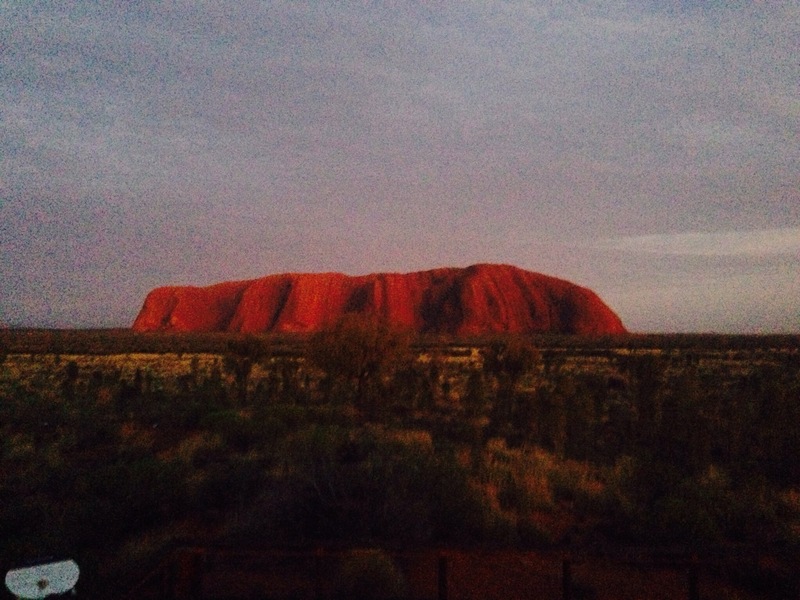 We made our way back to Uluru that evening to witness the sun set on the rock and it was more stunning than sunrise! 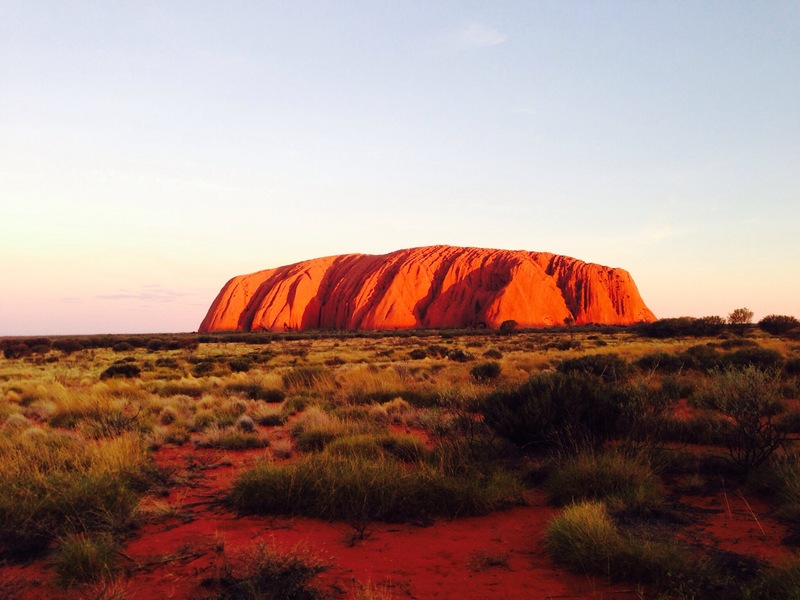 The sandstone glows red in the fading light as shadows of the monolith are cast across the outback absolutely incredible! The next morning we were up early and headed for the climes of South Australia. 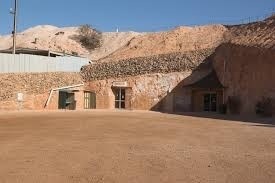 Our original plan was to drive to the strange underground town of Coober Pedy. A dusty town of 1,695 know as the opal mining capital of the world, due to…. well the number of precious opals mined there. 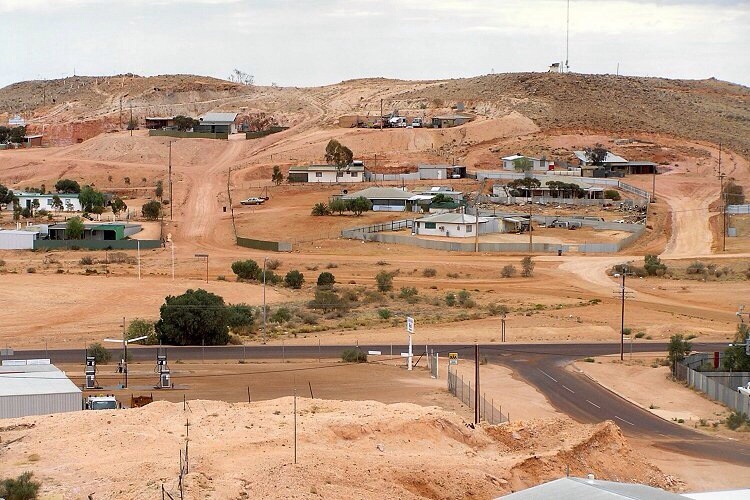 A number of hotels, the church and peoples homes are built underground due to the intense heat during the day, in fact the name Coober Pedy comes from the the aboriginal kupa-piti which means “white men’s hole”. We decided due to the steep hotel prices in town that we would continue on and find a campground somewhere in S.A. This decision meant that once again we were taking the risk of driving at night, this was unfortunately a bad decisions this time as about a half hour after sunset our luck ran out and we hit a kangaroo. This was not a little wallaby either,it was a fully grown big red! This is the reason we were so insistent on getting a vehicle with bull bars and thank god we did or this would have been a serious wreck. Carly and I were both okay and the truck only suffered a small dent and broken turn indicator, we got off easy. Unfortunately the same could not be said for the kangaroo. A very nice woman stopped as we were assessing the damage to see if we were ok, which was nice to think that if it had been serious we would have had help. After some quick duct tape repairs we were back on the road, we were able to use our VHF radio to connect with a road train that had passed when we were pulled over and catch up with him and essentially use him as a blocker. The truck driver was great, using his turn indicators to let us know when he saw Roos on the side of the road so we knew to back off just in case. We tailed the rig to the inlet town of Port Augusta, mentally exhausted but relieved to be safely at a campsite AND there was a cool breeze! Amazing that in a few hundred Km’s we had gone from 46 degrees to 13! All In all the outback is an incredible place and I look forward to returning to the red centre as there are other places we didn’t get the chance to see and hikes and 4×4 trails we would like to do in more reasonable temperatures. The outback is another example of Australia’s extreme and rugged landscape and climate making this a dream destination of anyone searching for a real adventure. Wide open spaces, and a landscape that has a real spirit this is a place to see and one of the worlds last wild places. We hope you enjoyed this post and all the updates on wanderingwinters.com check back often as we will be adding photos to all our posts when we get pics uploaded off our cameras, THERES LOTS!